Filled up on the road away from home, went to a HESS station. It smelled ok going in, but now the smell is foul. Is there a deodorant for stinky diesel? Would a gallon of fresh pure canola oil help the smell? Here is a closely related topic. If i were you, id put a shock dose of Biobor(or equivalent) in the tank...who knows what crud is in that fuel. 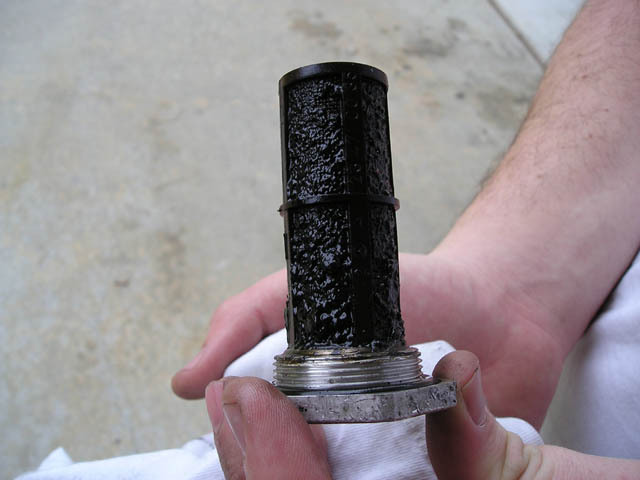 I wouldn't go as far as saying that Hess is bad, but I've gotten a dirty inline fuel filter more than once after filling up with them. Are you smelling raw fuel, or saying the exhaust smells bad? If you're talking about the exhaust, virgin veggie oil has almost no smell and won't help much. Fortunately for me, the fuel that my local Hess has always looks like Mountain Dew. Very similar to Amoco Premier Diesel. The Texaco around here has yellowish looking diesel that smells pretty bad... they also want more money for it. Two hours of driving and the exhaust smells like diesel again. A septic tank would have smelled better than the toxic waste odor from my exhaust. Last edited by whunter; 10-05-2009 at 05:59 PM. What the heck is going on around here. I dumped bio bomb in the tank "again". I am glad it was only a half tank this time. I am going to take a Clear Quart bottle sample before fueling; from now on. The odor from the exhaust smelled like filthy locker room. Last edited by whunter; 01-03-2006 at 01:46 AM. Another tank of foul fuel today. I dropped a quart of Marvel Mystery oil in the tank, by the time I got home, the exhaust smelled almost normal. Where is this rotten smelling trash coming from, a sewer? I filled up at my normal high volume name brand station, it makes no sense to me. Last edited by whunter; 10-24-2011 at 08:00 PM. Perhaps you should pick yourself up some of that fuel scent stuff they sell for cars! Dad has some that he dumps in the dune buggies (usually as a prank on others in our group) and we get to enjoy all sorts of odd smells out there on the dunes. I have been running hydraulic oil and fresh veggie oil for weeks, but ran out. Half tank of diesel at my normal station, and it stinks like foul swamp muck. I plan to biobor and diesel911 the tank again tonight. What do you expect for a mere $3+/gal?? Rose pedals maybe? OPEC members need new Mercedes. Oil barons need new vacation homes on the Med. So what if thousands of us have to pay through the nose and then we get rewarded with weakass sewerdiesel. Think of the dozens of rich people that are benefiting from our sacrifices. Baby needs a new pair of shoes. French designer shoes. Only $1100. Labor Day in SoCal. Diesel was $3.21 to $3.89 gallon. New soy oil was $13.15 for five gallons at Smart & Final. They had some cubies that had damaged cartons, with perfect sealed undamaged oil containers inside for $9. While I was dumping in the first five gallons a package boy ran out to warn me. I told him I had to use veggie oil because I ran out of coal. $2.79 and it stinks of swamp mold. Over by 275/94 junction My fuel light came on, stopped to fill up, only took ten gallons to top off. The diesel was $2.79 and it stinks of swamp mold. I carry Biobor and Diesel911 in the trunk, dumped a dose of each in my fuel tank, station was filled this morning (clerk says). To end the day, family went window shopping, stopped to fill the wifes gasser, the gasoline smelled nasty, like bad (fermenting) swamp gas. I am getting very tired of this trash they call fuel.